Special occasions should be special. That means you should feel special. If you’re pulling from your own closet, that’s easy. You just grab your favorite suit, and you feel like a million bucks. Unfortunately, that’s not always possible. Sometimes you have to put your fate in uncertain hands. Sometimes you have to rent a tuxedo. Wedding season is just about in full swing, and that means you might have to get on a plane (or multiple planes) to far-flung areas to support your friends as they get hitched. When attending a wedding, there is so much to consider. Will my ex be there? How open is the bar? But don’t forget to do your due diligence when securing your tux. Even if you find yourself acting as a groomsman in a small town, you don’t necessarily have to place yourself at the whim of an uninformed teenage Men’s Wearhouse employee. Knowledge is power, and a little research before you handle your rental can go a long way. 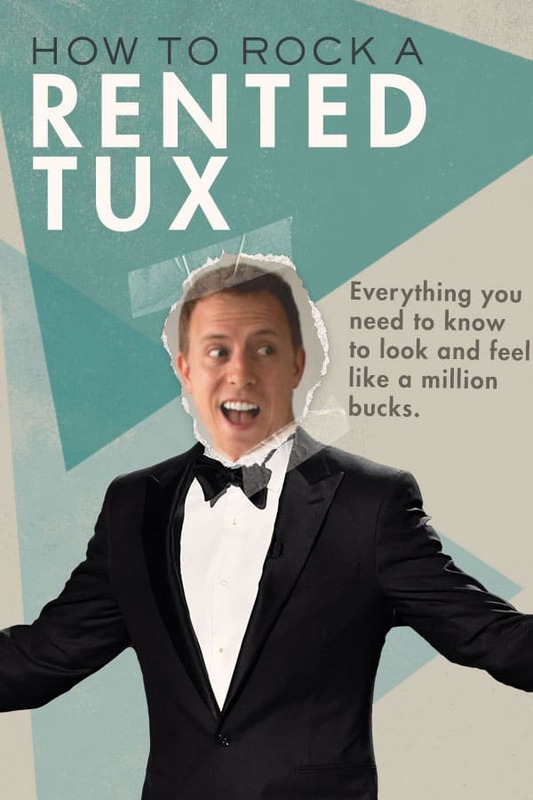 Let’s talk a bit about how to make the right choices when you rent a tuxedo. First, we’ll discuss the history of the penguin suit, then we will get into what makes a tux special, and then we will help you make sure you look special on that special occasion. 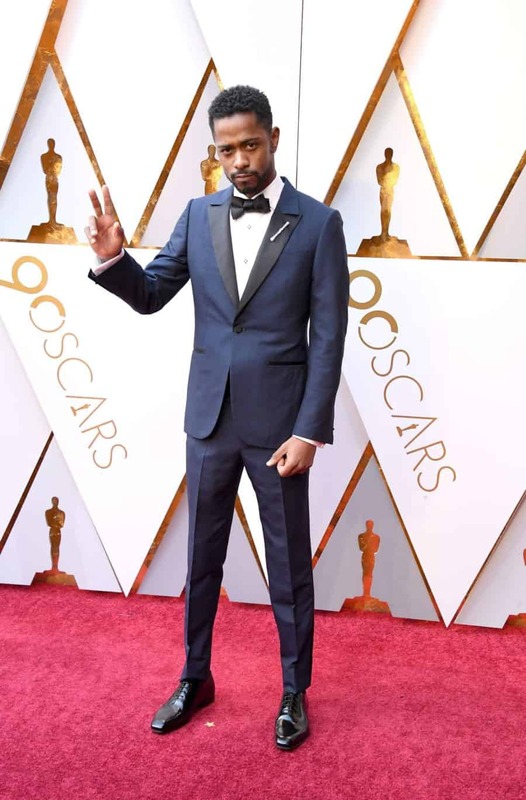 What makes a tuxedo different from a suit? How should a tuxedo fit? Should I buy a tuxedo? So many things in fashion are named for people. But, the tuxedo is actually named for a place. In the 1880s, American tobacco tycoon Pierre Lorillard decided to get into the real estate business. His first big effort was a well-to-do community in upstate New York named Tuxedo Park. If you get enough rich people together in one place, they are going to need their own social club, and Tuxedo Park was no different. The Tuxedo Club was born. Lorillard wanted to differentiate his club from older, stuffier social halls of the day. He (perhaps with the help of a friend or his son) decided on a bit of a fashion rebellion. Instead of the long tailcoat and white tie that was the custom at the time, he ordered a tailless black jacket for one of his parties. This coat, modeled on the “dinner jacket” and “smoking jacket” that had been popular in Britain since the 1860s, was an instant hit. Ironically, modern men’s formalwear essentially started as the mid-1800s version of the zoot suit. It is important to note that while the dinner jacket was black or dark blue, the tie and accessories were white. 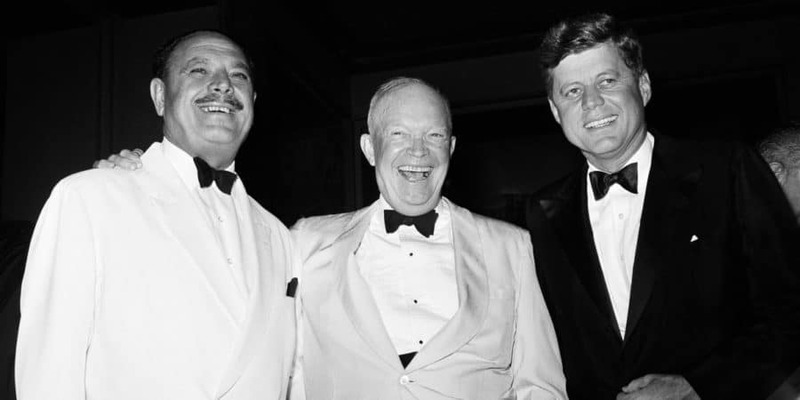 This is why “white tie” remains a phrase to denote stuffier events, even though actual white tie affairs are long dead. The shift in formal fashion caught on like wildfire, and by 1889, you could wear tuxedos to New York’s Metropolitan Opera without raising an eyebrow. From the turn of the century onward, the tuxedo would be the gold standard in men’s formalwear. 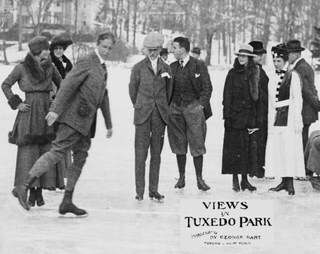 The 1930s were a crucial decade in the evolution of the tux. The 30s saw the addition of the cummerbund as a favored tuxedo accessory, and the addition of midnight blue and double-breasted coats to the roster of acceptable formalwear. From a commercial perspective, the 30s saw the rise of ready to wear, off the rack tuxes. Tuxedo rentals ensured that what had been primarily the domain of aristocrats would become the standard for formal celebrations of all classes. Tuxedos have remained the standard in formalwear in one form or another ever since. The sacrifices of World War 2 saw a dip in formalwear; the so-called “white tie” formal dress of the pre-tuxedo era totally died. The 1950s would see the rise of the “Continental Look,” marked by a slim profile and decorative lapels. The 60s would bring with it velvet jackets, oversized bowties, and wide lapels. In the 1970s, pastel and powder color tuxes accompanied by shirts finished with ruffles and lace were all the rage. Today, over 130 years after the first tuxedo was worn, we favor a simple, stripped-down style that has come to define our conception of elegance. Why can’t I just wear a suit? We’ve all asked ourselves this question after looking at a rental price tag or after too much time spend fumbling with a bowtie or cummerbund. A suit and a tuxedo are, in fact, quite different. First, there are some obvious physical differences. Traditionally, tuxedos have satin facing on their more pronounced lapels and often have a satin stripe down the pant leg. There are also a number of accessories such as the cumberbund and bowtie that further delineate a tuxedo at a distance. You also wear a different type of shirt with a tux than you would wear with a suit. 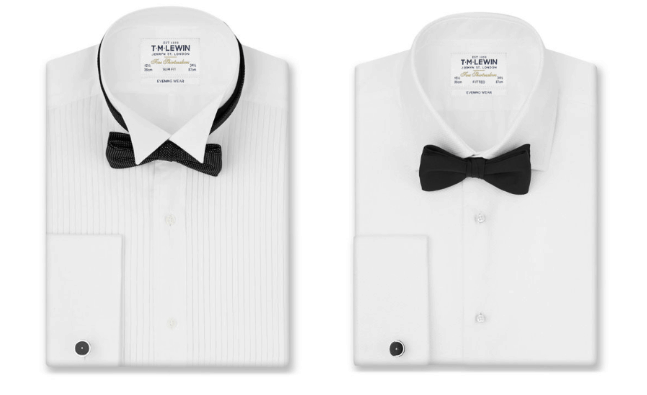 Tuxedos shirts either come with wing or turndown collars. The wing is more shallow than the turn down, but both are less collar than what you usually see with your day to day dress shirt. 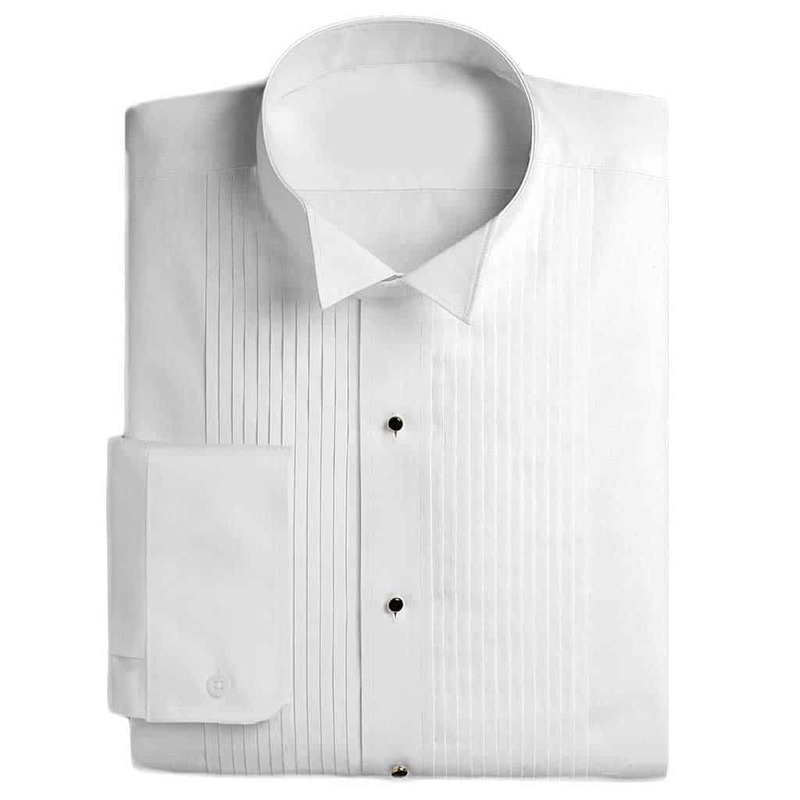 Tuxedo shirts also tend to have french cuffs that are properly worn with cufflinks. Overall, there is an aesthetic difference that comes with these strangely particular standards. With formalwear, you are adhering to a “form,” a particular expectation. Tuxes minimize choice and maximize simplicity with these rigid expectations. Tuxedo jackets have no flaps. Tuxedo pants have no pleats. They generally only come in two very similar colors. That isn’t to say that you can’t break these rules when wearing a tux, but understand that the environment you’re entering likely requires a tux for a reason. Rule breaking, if done with anything short of precision, may just be interpreted as sloppy. When thinking about the right fit for a suit, you should consider the principles of style that you already know. If you need a refresher course on how a suit fits, take a look at our Principles of Style. Just bear in mind that you might want a slimmer cut than you normally wear for a formal event for the simple reason that your outfit will be for one night only. Comfort might have to give way to aesthetics. Any formal photos taken at this event will likely be taken with your jacket buttoned. Reflect that in your fitting session. You’ll want a bit of an hourglass figure: nothing boxy. But, you don’t want it to look like it took a team of assistants to get that jacket on either. The majority of tuxedo jackets are single button and single breasted, but that is not a hard and fast rule. Also, most tuxedo jackets are unvented. Double vented jackets are also acceptable. A single vent may be viewed as a tad informal. Shoulder padding is common for tuxedos and can look good. Just make sure the padding doesn’t extend beyond the tip of your shoulders. Is the padding creating a crease or roll in your jacket? If so, the jacket is too small or there is too much padding. There are slight departures from your standard suiting principles when it comes to tuxedo pants. You will want a little less than a medium break, with your pant leg landing along the top of your laces. While the casual waistline has slipped steadily downward over the decades, tuxedo waistlines are still at the navel. Wearing them lower will cause the seat and crotch to droop lower than intended, and will result in pants that are too long. If you can slip more than one finger between the collar and your neck, the shirt is too loose. If you can’t fit a finger between the collar and your neck, the shirt is too tight. Cufflinks, studs, and facings can all help your look. Just make sure whatever choices you make all work together. These items are worth purchasing if you’ll be renting tuxes regularly. Ties.com and The Tie Bar are Primer favorites for these needs. Amazon also has a broad selection. If you’re want to try a brick and mortar option, Brooks Brothers offers a surprising array of cufflinks, though you’ll pay a bit more there than at online only retailers. You'll also have the choice between a plain or piqued bib – which is the style of the front of the shirt. Either is acceptable, but we'd politely ask that you avoid the 70s era ruffled bib. This all might feel overwhelming. You have to consider all of the fitting room rules that come with any tailored suit, and you have the particular traditions and customs that come with a tuxedo. It can all feel as confining as a cummerbund after four shrimp cocktails. But it doesn’t have to. You can still find a way to show off your personal style and stay on the right side of formal requirements. Which brings up a good point: Cummerbunds are on the border of old fashioned – originally intended to cover that awkward shirt tuck bulge – but most gentlemen opt to go bare or wear a vest. If you do choose to wear a cummerbund, it should match your jacket and pants. Here are a few of the best examples of how you can bend the rules without breaking with expectations we’ve seen from celebrities recently. 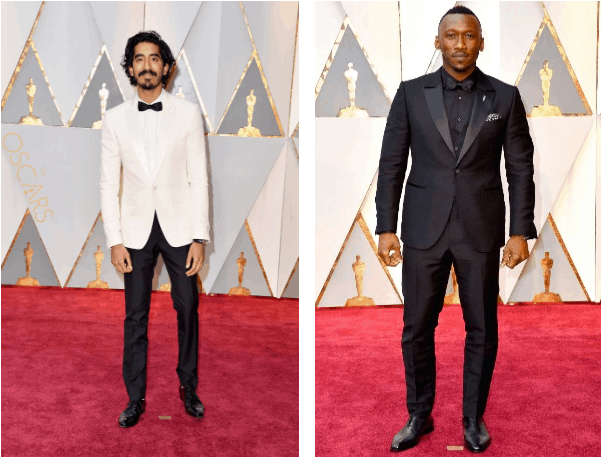 These two looks from last year’s Oscars, from Dev Patel and Mahershala Ali, show how the classic black and white color palette can be subverted. A white jacket or a black shirt are still in bounds on most formal occasions. Some other colors, most notably maroon and blue, can work well for tuxedos. Black lapels and bowties can be a way to anchor the look in formality and avoid Dumb and Dumber territory. 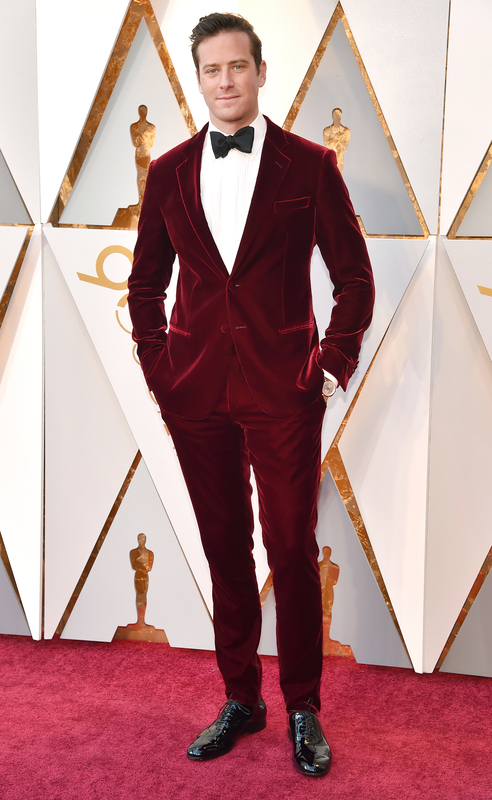 When Armie Hammer went to the Oscars in burgundy least year, he chose velvet material to lend his look an air of the classic. If you aren’t sure about a risky color, choose midnight blue. Midnight blue can look as distinctive as any other color, and yet, you aren’t really taking a risk. One well-placed departure from the classic can go a long way. Look how Matthew McConaughey hews so closely to the classic ideal but tops it all off with a red velvet bow tie. Not everyone will want to go double-breasted, but look how well Tom Holland pulls it off here. One of the best style moves you can make is to execute a classic look flawlessly. 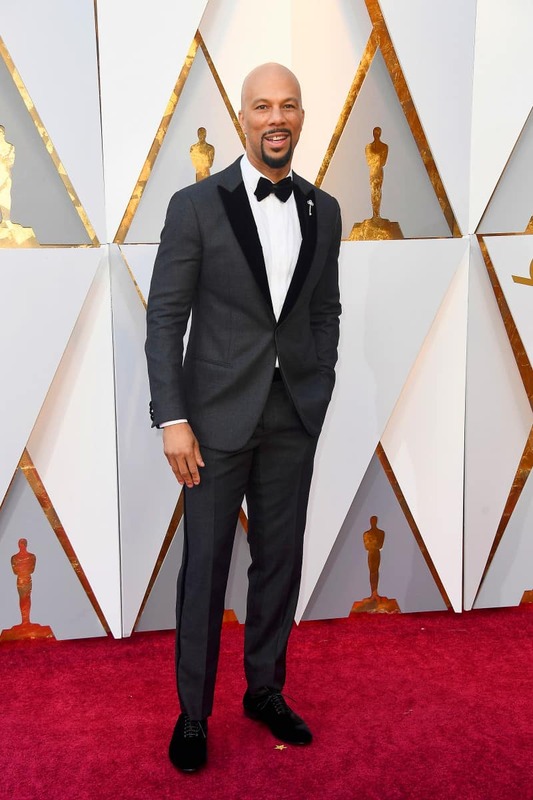 Here, Common isn’t doing anything special, but he looks extraordinary. Some embarrassing pitfalls are all too common at formal events. Here’s what not to do. Avoid clip-on bowties. Self-tie is never a mistake and there are a ton of YouTube videos to consult. Avoid matching your date. It will distract from both of you. Avoid casual shoes. Dress shoes only. Almost always in black. Make them shine. Avoid belts. Tuxedo pants do not have belt loops. Avoid any shirt without French cuffs. They are an essential element of the tuxedo. Avoid cuffed or pleated pants unless specifically blessed by a professional. Avoid too many accessories. Different statement pieces make different statements. Now that we’ve talked about what to look for when renting a tuxedo, let’s talk about where to go when it’s time to pick out your tux. While brick and mortar stores like Men’s Wearhouse and Joseph A. Banks have that tactile appeal, many wedding experts now recommend the variety and flexible return policies of online retailers. Here are some of our favorites. With their beautifully designed website and precision delivery, The Black Tux is a leader in online tuxedo rental. The no hassle return policy means that everything is going to be perfect for your big event. 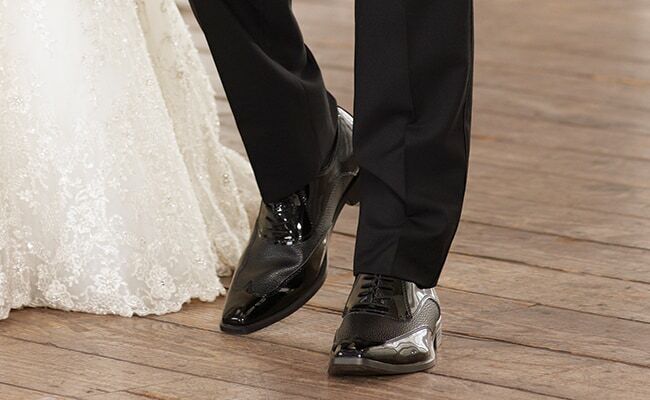 Many customers like The Black Tux for their commitment to quality; their rentals are worn on average far less than their competitors before they take them out of rotation. Though Menguin doesn’t offer the same tight delivery windows you’ll find at Black Tux, Menguin can be a great choice if you have some lead time. Menguin specializes in outfitting groomsmen, so if you and your boys want to look beyond brick and mortar, this might be a good fit for you. While they don’t offer a ton of variety, Generation Tux is known for their quality. Their streamlined process is easy to navigate, and customers report stellar service and priority returns when needed. 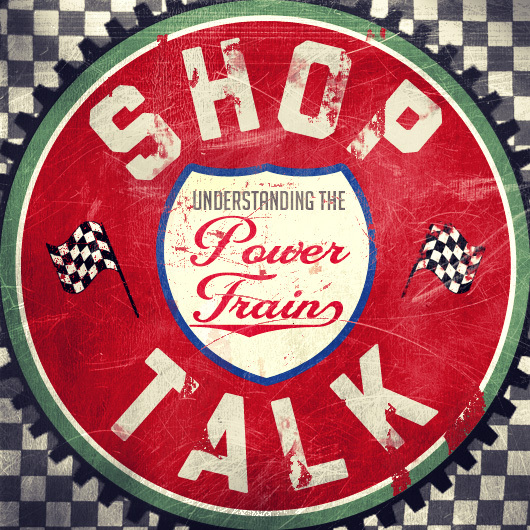 If you are leaning towards brick and mortar, you might be looking for the personal tailored touch that you may not get at a big box chain store. If you are feeling an inkling that you want to have more control in the process, think about buying a tuxedo. Yes, this might be an investment. But, this might be an investment worth making. And owning might not set you back as much as you think. A Calvin Klein off-the-rack tux starts at $299 on Amazon, and while commenters report it's baggier than promised you have more than enough in the bank for alterations. Stepping up a level in quality and price, online options at Nordstrom range from $429 for their in-house label to several thousand for established designers. Springing for a custom tux doesn't have to break the bank, either. 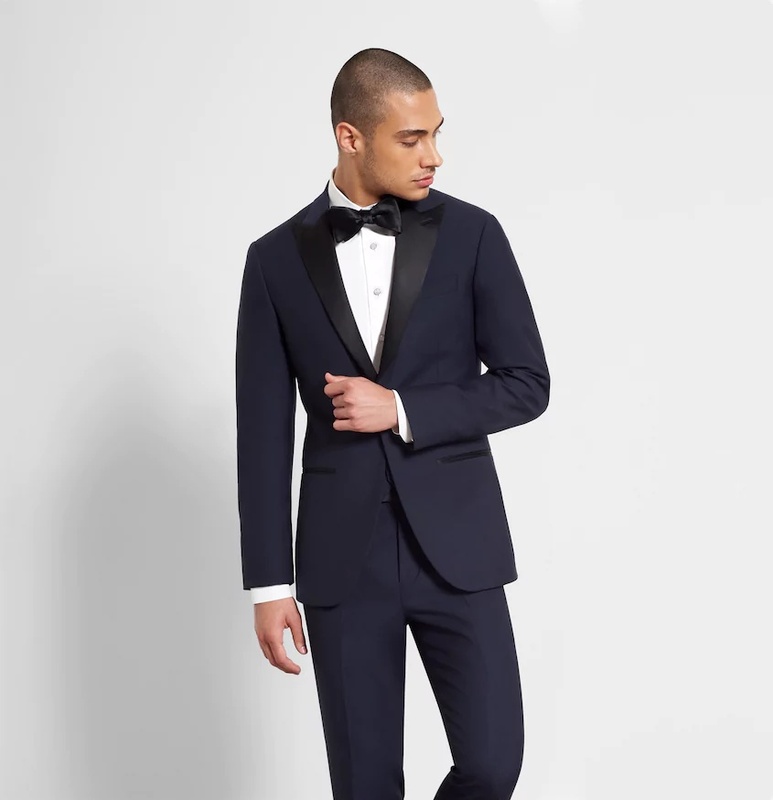 Indochino offers a complete tux bundle starting at $559 – less than many designer off-the-rack non-tuxes! 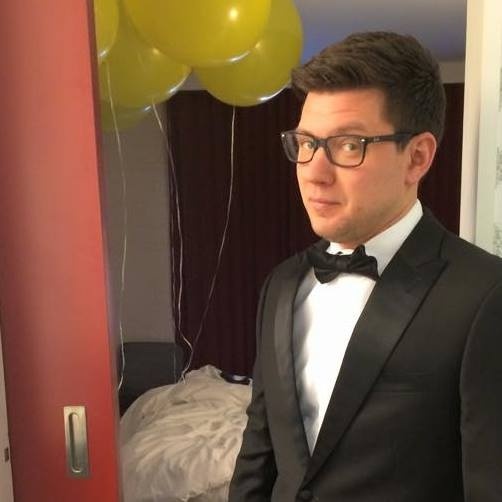 Consider this: if you have your own tux, it’s all the more likely you’ll end up going to the kind of events that demand a tux. 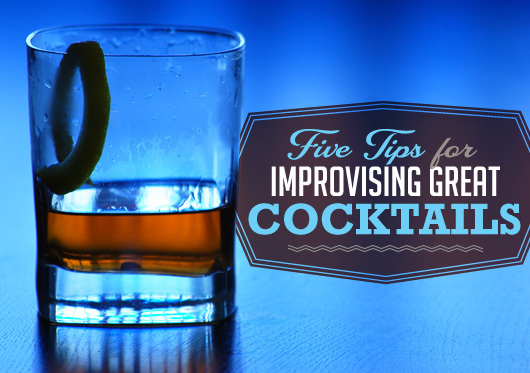 All of these tips and tricks don’t matter one bit if you don’t feel good. Pick a tux that you feel comfortable in. If you don’t like the way you look, nothing else matters. The whole point of putting on a tux is to look and feel your best! “This is why “white tie” remains a phrase to denote stuffier events, even though actual white tie affairs are long dead.” – This is actually not quite true. In New Orleans and surrounding cities (including Mobile, the original home of Mardi Gras, Baton Rouge, Houston, Pensacola, etc), late night formal affairs such as Mardi-Gras and Debutante balls all require a full White-Tie/tailcoat get-up (including white vest, white suspenders, white gloves, black tailcoat/trousers, and patent leather black shoes). Tens of thousands of men involved in the social circles of the deep south have this get-up hanging in their closet, as most of these balls have well over 1,000 in attendance (and there are dozens each year). Any respectable men’s store along the gulf coast likely has the full kit stocked for purchase through the winter months. 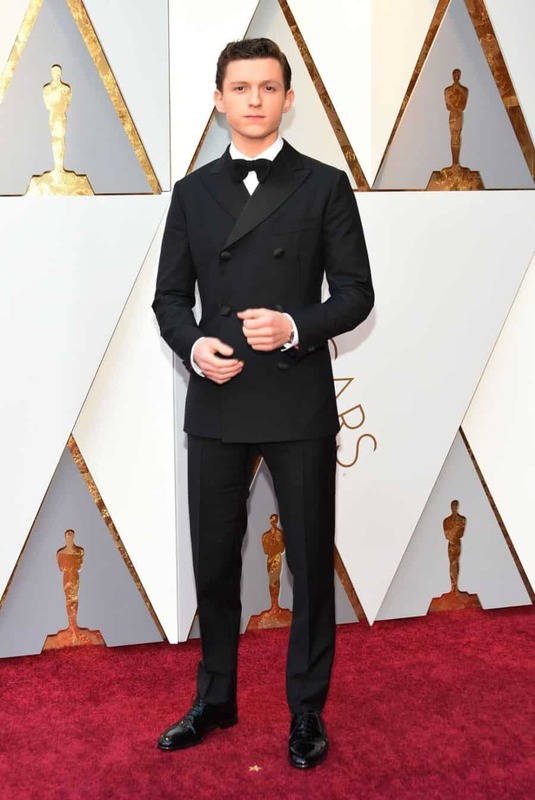 I agree that a double breasted dinner jacket is an acceptable and elegant option (and will include more than one button). However, in its single breasted iteration, the jacket should never have more than one button. I’ve rented from The Black Tux three times now. Two suits and one tux. I highly recommend them! https://uploads.disquscdn.com/images/51637a7b54ae6555f8523c8a01026534f3a3211c6e3a60daf3d89b17b9080c9a.jpg https://uploads.disquscdn.com/images/a46bdaa12aa1a41556fe7a80b93f9c4be752d65ee1c3df79ea9ff173f49858e6.jpg The Black Tux is untouchable. I wore it to my friend’s wedding and never wore a better piece of clothing in my life. I actually was flirting with my future fiance via text the entire time and was so smitten that i LEFT MY TUX ON THE MEGA BUS! The Black Tux was so cool that they didn’t charge me late fees for the two weeks it took me to get it back out of a Swickley, PA bus station ha ha! Needless to say, I am using them for my wedding September 1st. Midnight blue.